Ugly Kid Joe is an American rock band from Isla Vista, California. The band's name spoofs that of another band, Pretty Boy Floyd. Ugly Kid Joe's sound includes a range of styles, including hard rock, funk metal and heavy metal. After releasing an EP, three full-length albums, and touring extensively throughout the 1990s, Ugly Kid Joe disbanded in 1997. 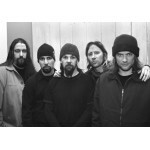 They announced a reunion in mid-2010, and are going to release a new EP called Stairway to Hell on June 5, 2012.